DeWolff is around for so long already that it is becoming harder to imagine a time when there was no DeWolff. Still the two brothers and nephew are young for a band that is around for 10 years and 6 albums. After the slightly disappointing, after two great albums by comparison, 'Roux-Ga-Roux', the band returns with Thrust. An album aptly title to be sure. Again worked out and recorded in its own DeWolff cave in Utrecht, the band seems to have found a new high. The learning curve DeWolff is on means that the band has explored (in part) new avenues, consolidated what it is good at and still grows melodically. The band is able more and more to write songs, without losing its strength, producing groovy music inspired by bands from Traffic to The Black Crowes, that is or is not an excuse to jam the song inside out, upside down and back. The fact that the basis of the song is getting better means that the band becomes ever more attractive to a wider audience. Having been present at several shows in the past, I know how good this band can be live. 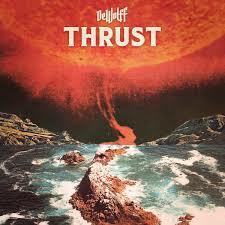 For me it seems that with Thrust DeWolff has found an equilibrium between the two sides. Where 'Grand Southern Electric' songwise was great but arguably the influence of veteran producer Mark Neill too large and 'Roux-Ga-Roux melodically inferior, Thrust is DeWolff as powerhouse. The band allows the blues to enter the album. 'Once In A Blue Moon' is a great example of that. Not that this is a 12 bar blues, it has nothing to do with that. It is in the feeling the song captures and the great melancholy Hammond organ solo. Picking up on soul along the way as well. A ballad is pulled of totally convincing as well. Some Hendrix licks are incorporated in the softest of songs, that is allowed fly off later on, 'Freeway Flight' indeed. Where DeWolff totally succeeds in on Thrust is to capture its groove on record for 100%. In the combination with the melodies this leads to a more convincing album. The energy simply jumps out of my speakers into my ears and making it impossible to sit still, not to smile contentedly and sigh oh, yeah, while submerging in the DeWolff universe. The firm drumming, the strong riffing on guitar and organ are present underneath it all. Over it the guitar spews licks or solos or the organ takes of in some great solos. Pablo van der Poel's singing becomes more convincing with age and his vocal melodies more adept. Together it emulates music that associates most with the south of the U.S. in the 1970s, southern rock. To that DeWolff adds enough of Deep Purple, Led Zeppelin and Uriah Heep of the same era, creating a beast that becomes irresistible. Live the band already was unbeatable, on record it is able to vary so much that it slowly is gaining on its influences with every chance of overtaking them. The Black Crowes? Don't make me start laughing, barring a song of three, four. The Faces? Ha!, passed in the fast lane, waving at 'Stay With Me', that barely manages to tag along. Summing up. If you like some good old classic rock spiced with the most fiery of Hammond organs, Thrust is your album and more. Much more.